"Camino Real" is set in a small town presumably located in Mexico but a product of imagination. As described in the play, the town has an expensive section dominated by a fancy hotel, the Siete Mares, which borders on a skid row. The skid row includes a dreadful flophouse, a pawn shop,and a fortune-telling stall run by a Gypsy. Beyond the town stretches a mountain and a desert. In a Prologue to the play Don Quixote's sidekick Sancho Panza says of Camino Real that "the spring of humanity has gone dry in this place." The play includes many characters, some of whom are historical, some are drawn from literary works, and some are contemporary. Characters wandering through Camino Real include Don Quixote, Sancho, Lord Byron, Casanova, Marguerite, Esmeralda, and more. The town also has its own mysterious permanent residents, including Gutman, the owner of the Siete Mares who also narrates the play, the owners of the pawn shop and flop houses, blind singers, aging prostitutes and the Streetsweepers, who serve as police and henchmen and discourage the expression of free thought or romance in the town. The major character in the play is Kilroy, 27, an American and former championship boxer on the skids who is cast into Camino Real with only memories of his past successes. Kilroy has been told he doesn't have long to live. He suffers from a bad heart which has expanded in his chest to the "size of the head of a baby." The characters in "Camino Real" tell their stories and interact in strange impressionistic ways which owe as much to the setting and to symbols as to the script. The thread of Kilroy's story runs through the work. He is robbed and then humiliated when forced to work as a "patsy" in the Sieta Mares. When Esmeralda, a prostitute and the alleged daughter of the Gypsy, regains her virginity by the light of the full moon, as is her wont, she and Kilroy have a paid relationship which strangely blossoms into feeling on both sides. In a strange sequence, Kilroy loses his money and his golden gloves to the pawn shop and also loses his expanded golden heart. But the play suggests that Kilroy recovers something of his soul and spirit at the end. "Camino Real" is an unabashedly romantic play. Its many characters are aged, dissilusioned and burned out and strive with varying degrees of success to regain their zest for life, creativity, and passion. As is often the case in Williams' plays, the characters tend to be the heart of the playwright writ large. The plays succeed to the extent that Williams is able to universalize his feelings. "Camino Real" concerns itself with artists, outcasts, and losers. The tone of the work reminded me of Allen Ginsberg's poem "Howl" which would be written two years later. Indeed, "Camino Real" has been described as the first "bop" play. Here is one of the key monologues of the play spoken by the prostitute Esmeralda, Kilroy's lover.
" God bless all con men and hustlers and pitchmen who hawk their hearts on the street, all two-time losers who're likely to lose once more, the courtesan who made the mistake of love, the greatest of lovers crowned with the longest horns, the poet who wandered far from his heart's green country and possibly will and possibly won't be able to find his way back, look down with a smile tonight on the last cavaliers, the ones with the rusty armor and soiled white plumes, and visit with understanding and something that's almost tender those fading legends that come and go in this plaza like songs not clearly remembered, oh, sometime and somewhere, let there be something to mean the word honor again!" Subsequent to its initial Broadway failure, there have been attempts over the years to revive "Camino Real". The work continues to provoke widely varying responses. In addition to its obscurity, the play is difficult to perform due to its length, its large cast, and its elaborate, costly setting. I saw the play when it was performed at the Arena Stage in Washington, D.C. some years ago and had difficulty with it. It is not hard to understand that the play would be hard to grasp by an unsuspecting audience watching it on the stage. I also had trouble with the play when I read and reread it. It is not an easy work to grasp and requires patience. If not one of Williams' more successful works, it is poetical and rewarding. John Lahr's biography, "Tennessee Williams: Mad Pilgrimage of the Flesh" discusses "Camino Real" in detail and encouraged me to revisit the play. 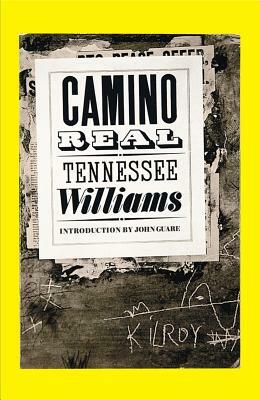 In addition to this New Directions edition, "Camino Real" is available in the first of the two Library of America volumes devoted to the plays of Tennessee Williams.